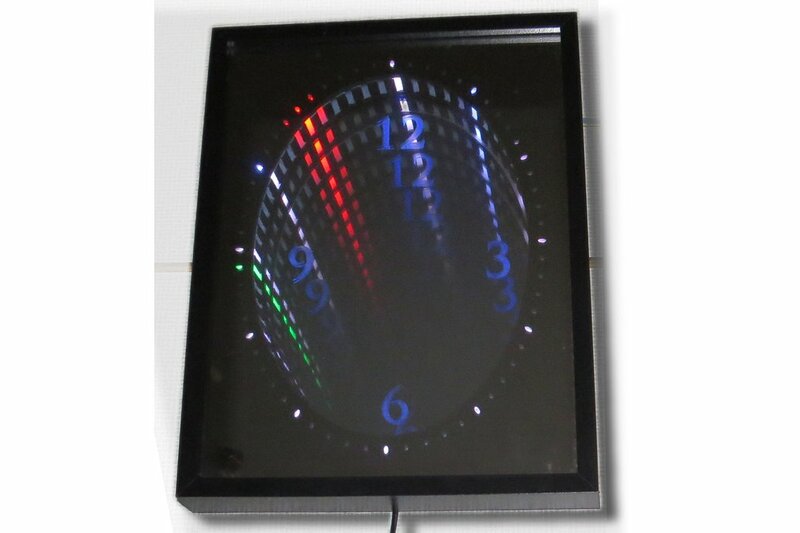 Wall clock with "infinity mirror" effect. 64 bright RGB LEDs with lots of magic visual effects. 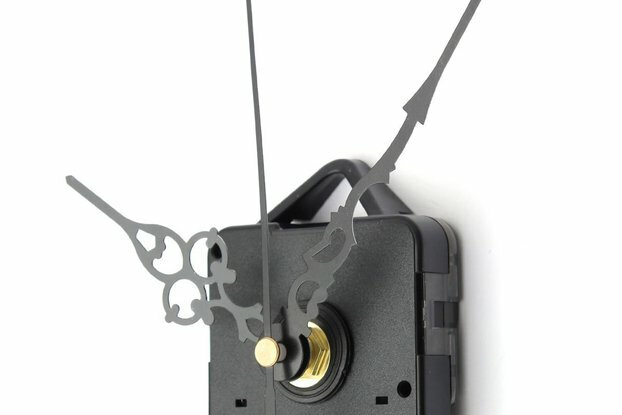 This is an analog wall clock with beautiful visual effects. The time is indicated in the oval "Infinity tube". I was inspired by numerous "infinity mirror" projects and decided to make the best one for my home - and of course for you. Bright LEDs are perfectly visible both at daytime and in night mode. You can chose one of seven display animation modes, or switch to Presentation, where the display mode will change every 15 seconds, showing a catching-eye animation during each mode change. If you don't want to be disturbed by bright animations at night time - simply hold the button for 2 seconds to turn the screen off. The clock is controlled by single rotary encoder/pushbutton - please see the enclosed operation chart under "Documentation" link below. After plugging in mains, the clock displays a 20-second intro animation, and then switches to time display mode. Red LED stands for hour hand, green - for minute hand, blue - for seconds. You can change brightness separately for sunny and dark conditions - light sensor will automatically apply the appropriate brightness level. All settings are stored in permanent memory. Here is a 1-minute YouTube instruction How to Adjust the Time. Clock is powered from AC, 110/220 V. Cable length - approximately 1.45 m (4.75 ft). Cable is equipped with standard EU plug. For other types of plugs please contact me. Clock is equipped with backup lithium battery (coin cell CR2016), which keeps the time when the power cord is disconnected from mains. Clock dimensions: 42 x 32 centimeters (16.5" x 12.6"), weight about 3.7 kg. Gift box dimensions: 48.5 x 35.2 x 4.8 cm (19" x 13.9" x 1.9"). 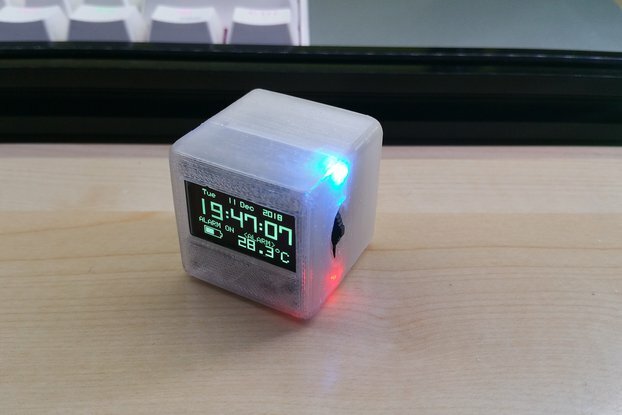 Clock is now available in 2 different colors: black and white. Gift box (please choose it in "Packaging" option) can be painted in oak, teak, or just leaved as a polished plywood. If my product is broken in transit, send it back for a full refund or exchange, it's that easy! If you are not totally satisfied with your purchase and it does not work exactly as described, send me a message and we can arrange a return. I will either send you a replacement or give you a full refund. Finnish Post is the fastest and most reliable way of shipment for my clock. Usually I send all the parcels during weekend and they arrive to any destination in USA in a couple of weeks.